Throughout its history, Thailand has been subject to periods of political instability that have at times given cause for concern among investors. In the past few months, investor sentiment has reflected the political uncertainty, putting Thailand in the news. Violent demonstrations by supporters of Thailand’s traditional Bangkok-based elite have raised concerns regarding the government’s stability under the pro-populist policy Prime Minister Yingluck Shinawatra, which draws its support from the poorer and more rural north and east of the country. Despite the political unrest, we certainly have not lost confidence in Thailand and believe its economy can bounce back, as it has time and again, from such adverse events. The country has actually been given the moniker “Teflon Thailand” for its resilience in the face of such past events and problems. I can’t say for sure how the political situation in Thailand will ultimately play out, but I do believe there will be some changes, and I also believe the fundamental direction of the Thai economy should be able to remain on a growth track. Regardless of the macroeconomic or political climate, we are bottom-up stockpickers and continue to look for opportunities to invest where we see potential on an individual-company level. In the past few months, protesters have attempted to topple the Thai government, triggering a slide in the Thai baht and its stock market, which posted negative performance in 2013 and was near flat year-to-date through late February.1 In December, my team and I were in Bangkok and were surprised to find little evidence that business and the busy shopping areas of the city were being interrupted by the political disturbances at that time. The main tourist areas were also largely unaffected. Our visit came just before King Bhumibol Adulyadej’s 86th birthday, so it is likely that the demonstrations were muted in respect for the king, who is held in high regard. Today, there is fear that continuing political demonstrations could begin to impact business, infrastructure projects and particularly the important tourism industry, which accounts for about 9% of the Thai economy.2 We have heard anecdotal evidence that some tourist bookings have been canceled as a result of the unrest. The Thai stock market can be volatile (as all markets can be) but Thailand’s market has proven resilient during past trials and tribulations. While short-term volatility is likely to continue to impact Thailand’s market as news events unfold, we believe Thailand will eventually find a way out of this latest crisis. Fortunately, elections in early February, strongly opposed by the People’s Democratic Reform Committee (which has led many anti-government protests), didn’t result in heightened violence. However, voting was disrupted in some areas of the country and it may take several more months to complete the process and fill vacant parliamentary seats. Unfortunately, protests were continuing into mid-February, most recently involving rice farmers, distraught over the government’s failure to pay for rice bought under a subsidy scheme, one of Shinawatra’s signature policies. The subsidy program is threatening to destabilize the budget. We believe that a number of factors could permit continued high levels of economic growth in the future. 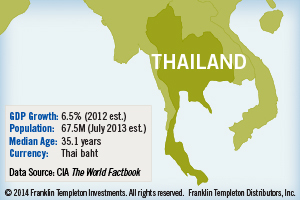 Thailand is a major center for outsourcing by Japanese companies, most notably in the production of automobiles. With Japanese Prime Minister Abe’s efforts to revive Japanese growth showing some signs of success, additional activity in Japan could transmit into increased orders in Thailand. 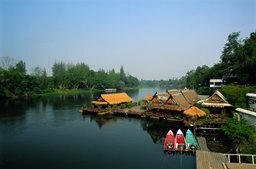 While Thailand’s growth has been strong, it has also been somewhat uneven with incomes in Bangkok and its hinterland markedly higher than elsewhere. Recent government policy has been aimed at raising incomes and increasing development in the country’s north, and we believe that this process could drive substantial gains in consumer demand supplementing the contribution of a strong export sector. Southeast Asia generally has seen a surge in middle-class buying power. Thailand’s neighbors, Cambodia, Laos, Vietnam and most recently Myanmar, have begun increasingly to adopt market-based economic policies and look outward for economic growth. These developments could ease constraints on Thai growth from shortages of labor and natural resources. Moreover, Chinese-inspired moves to upgrade regional rail links could improve economic links both between Thailand and its neighbors and within the country itself. In November 2013, Thailand’s Senate approved a bill allowing the government to borrow US$69.5 million for a seven-year infrastructure spending project in Thailand that could see high-speed rails linking Bangkok with Laos, the manufacturing zone of Eastern Thailand, Malaysia and the city of Chang Mai to the north, as well as upgrading existing rail and port facilities and improving Bangkok’s mass transit system. The infrastructure proposals could also provide a major boost to ambitious—but so far unfulfilled—plans to develop a major industrial zone and trade terminal based in the southern Myanmarian port of Dawei. Once linked to Thailand and its railways, Dawei could provide an attractive alternative route for international freight currently forced to move through the difficult and congested Strait of Malacca. Financing for the government’s infrastructure plans is in limbo at present following a legal challenge, but both the government and opposition broadly support the measures. We can’t exclude the possibility that “this time it’s different” in Thailand; that the present bout of political instability could segue into economic weakness and corporate losses. However, in our opinion, the balance of probability is that positive economic drivers could once again override the short-term impact of Thailand’s political turbulence. And, we strongly believe Thailand’s people and economy will rise above the bickering of the country’s politicians. Dr. Mobius’ comments, opinions and analyses are for informational purposes only and should not be considered individual investment advice or a recommendation to invest in any security or to adopt any investment strategy. Because market and economic conditions are subject to rapid change, comments, opinions and analyses are rendered as of the date of the posting and may change without notice. This material is not intended as a complete analysis of every material fact regarding any country, region, market, industry, investment or strategy. All investments involve risks, including possible loss of principal. Foreign securities involve special risks, including currency fluctuations and economic and political uncertainties. Investments in emerging markets involve heightened risks related to the same factors, in addition to those associated with these markets’ smaller size, lesser liquidity and lack of established legal, political, business and social frameworks to support securities markets. 1. Source: © 2014 FactSet Research Systems Inc. All Rights Reserved. The information contained herein: (1) is proprietary to FactSet Research Systems Inc. and/or its content providers; (2) may not be copied or distributed; and (3) is not warranted to be accurate, complete or timely. Neither FactSet Research Systems Inc. nor its content providers are responsible for any damages or losses arising from any use of this information. The SET Index is a capitalization-weighted index of stocks traded on the Stock Exchange of Thailand. Past performance is no guarantee of future results. An index is unmanaged and one cannot directly invest in an index. 3. Source: MasterCard Global Destination Cities Index, second quarter 2013. 4. Source: IMF World Economic Outlook, October 2013. Copyright © 2013 By International Monetary Fund. All Rights Reserved.